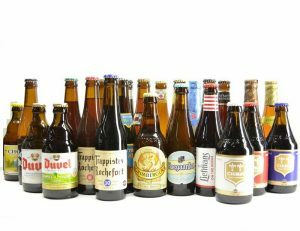 You would need to stay in Belgium for at least three years to sample all the beers that are produced in the country. In 2015, a team of experts concluded that there are nearly 1,600 beers available with 1,150 being authentic Belgian. One of the most popular breweries in Belgium is the Duvel. Situated in Breendonk, the Duvel Moortgat Brewery was founded in 1871. The brewery offers tours and also has an extensive shop where you can buy souvenirs and, of course, beer. Duvel produces a wide range of beers, some limited and some seasonal, which you can sample at the HQ. Duvel means Devil in Belgian dialect. This is one of the most popular beers in Belgium, and it’s blue label is a hefty 9%. It is drunk out of a glass resembling a flat champagne goblet. It is brewed at Scourmont Abbey, where beer was first brewed in 1862. The brewers also apply their talents to cheese making, and the two pair together beautifully. At 6.2%, Belgians call this beer light! It is brewed at the Orval Monastery, and its roots go way back to the 12th Century. You can visit the brewery and enjoy all it has to offer while sampling various tipples of choice. This brewery produces a beer that packs a punch at 9.5%. It is found in Antwerp, and curiously, the brewers say that it pairs exceptionally with asparagus. In fact, that is how they serve it during brewery tours. The beer is exported all over the world.